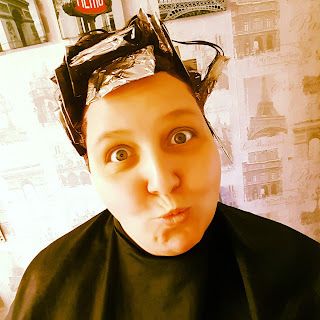 My friend happened to be free that day, so I went round and as we hadn't seen each other for a few weeks, we started chatting about everything, whilst also confirming that my friend could cut as much of my hair off as needed. As we chatted, me sitting on a chair with a hairdressers gown around me, my friend was busy chatting and setting up her equipment. At the time, neither of us were thinking much about the haircut, we were far more interested in our conversation and having a good old catch up. I could see that she was plugging something in and I saw that she was holding clippers, but I thought nothing of it. Maybe it was a way of giving a textured cut, maybe it was the only way to give the cut that I needed. I didn't know, I'm not a hairdresser! My friend is, however, and I trust her so I ignored her prep and carried on chatting with her. We're fairly sure that we'd still be friends, even if I had accidentally had half the hair on my head shaved off, but we're glad we didn't have to find out!